Disclosure: We were guests at the fabulous Palace Hotel San Francisco on this trip for purposes of review. We have paid for this hotel on many other previous visits. It’s our favorite in San Francisco! All opinions are our own. San Francisco has always been one of my favorite cities to visit and having a kid along has only made it more fun. 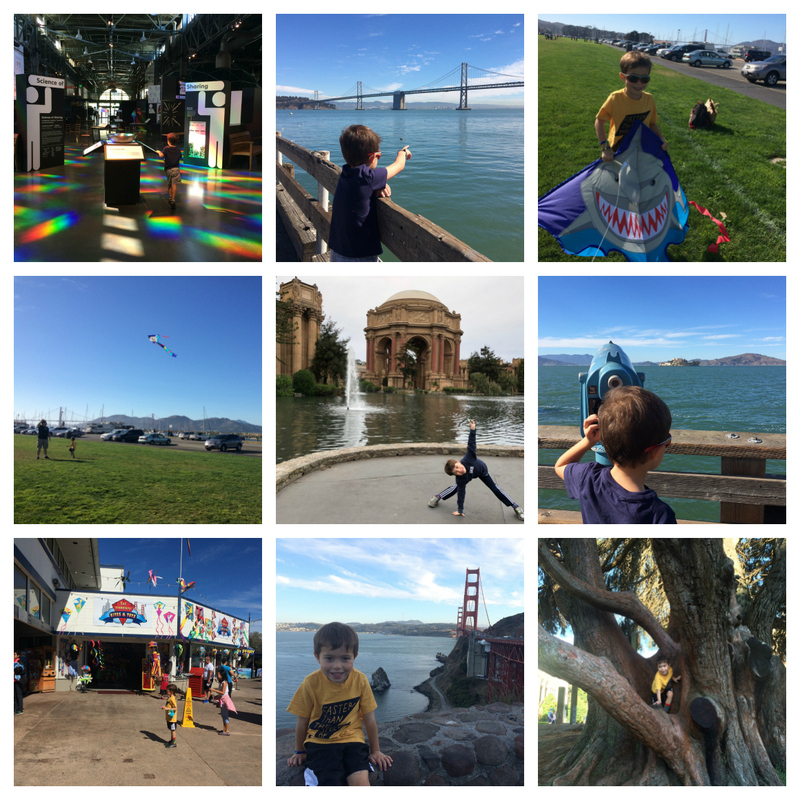 There are so many things to do in San Francisco with kids, I can’t recommend it highly enough. 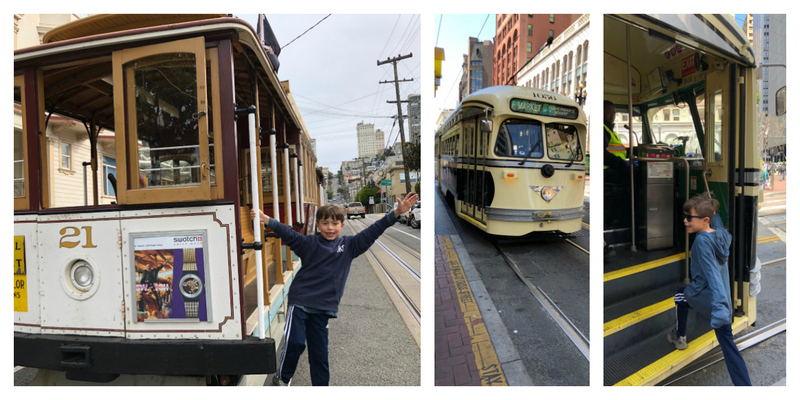 These are just a few of my favorite things to do in San Francisco with my 8 year old son, Harry. We love to stay at the Palace Hotel San Francisco. The downtown location means you can walk to shops, restaurants, the Embarcadero, Chinatown, Union Square, and the famous cable cars. The Palace Hotel San Francisco is a beautiful hotel built in 1875 that has been completely refurbished to show off its original beauty and character. Staying here allows families to get a feel for both old and modern San Francisco. The hotel has two stunning glass domes from the original hotel, which are found in the swimming pool and the garden court. The rooms at the Palace Hotel are newly rehabbed, luxurious and very large, especially for a city hotel. For families who really like to spread out in spacious accommodations, the hotel offers gorgeous suites with luxury bathrooms that include marble vanities, heated toilets, huge tubs, and lots of room. 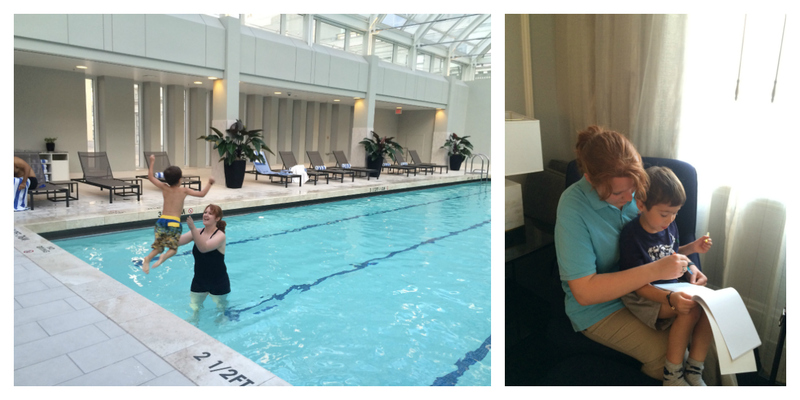 One reason we love staying at the Palace Hotel is that of the indoor swimming pool. San Francisco can be chilly, so it’s nice to have an indoor pool, and you can see the twinkling lights of the city through the antique glass dome. The Palace Hotel also has a Ghirardelli shop on the main floor so you can end your day with a sundae and take it up to your room to enjoy a famous San Francisco chocolate treat. 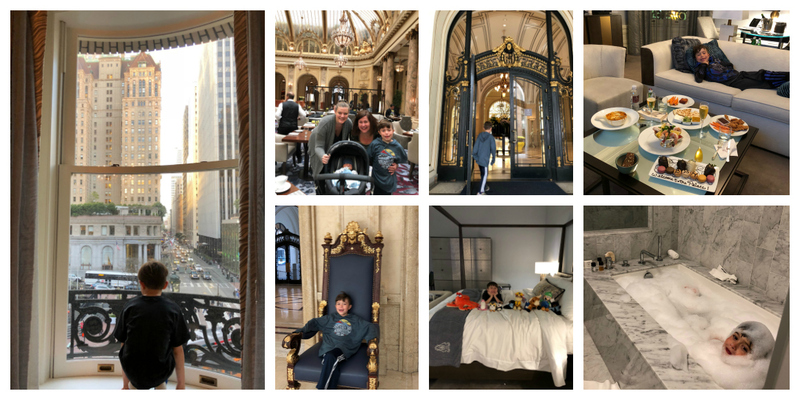 Service at the Palace Hotel stands above and beyond, which is why I recommend it so highly. 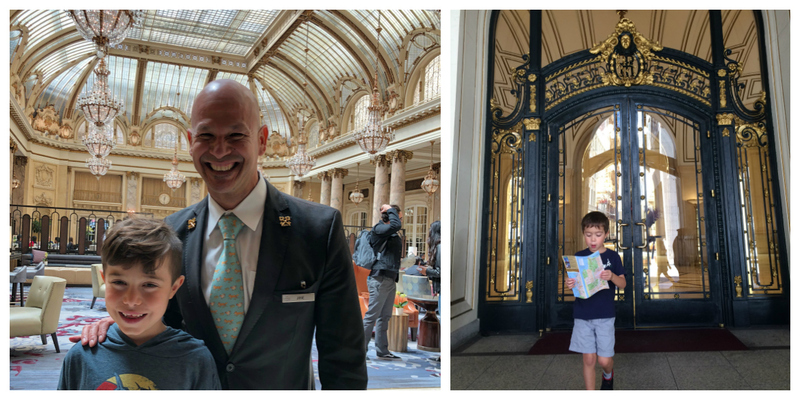 The concierge, Jose, remembers us every time we visit, even if it’s been a year or two. He always does such a great job to help customize a San Francisco itinerary based on our interests. Jose really cares about guests and will plan out your entire day for you. He often recommends things besides the usual tourist sites, which is great! He will even map out your transportation, helping you get from each spot to the next using street cars and trolleys. Harry loves studying the maps after he plans out our days! On the rare times we visit San Francisco and don’t stay at the Palace Hotel, we still make a point to have breakfast or brunch at the Garden Court restaurant. They have a huge, delicious brunch served under the antique beautiful glass dome, which feels like you’ve been transported back to Victorian San Francisco. There are so many great places to eat in San Francisco, it can really be hard to decide. Luckily, there are many family-friendly restaurants in San Francisco where you can comfortably bring your kids for delicious food. 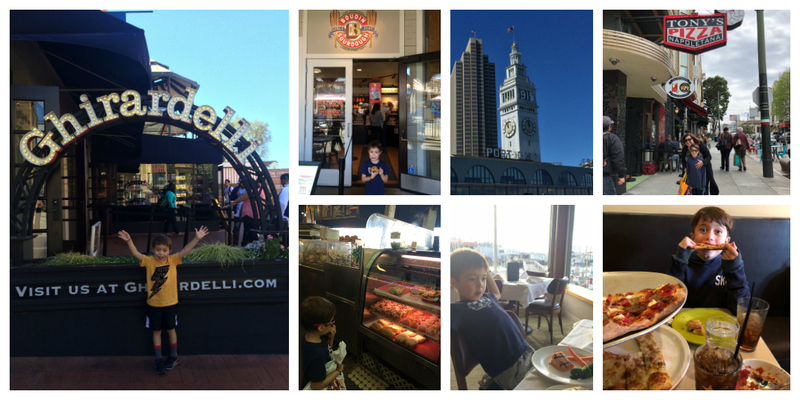 There are a few of our favorite family friendly restaurants in San Francisco. As mentioned above, we make sure to have breakfast or brunch at the Garden Court Restaurant at the Palace Hotel every time we come to San Francisco. The room is grand and lovely and the buffet selection is terrific! No visit to San Francisco is complete without a trip to Ghirardelli Square for the best chocolate in San Francisco. There are many Ghirardelli locations around town, but the best experience is to visit Ghirardelli Square, where you can see the old factory and a huge chocolate shop. This is the best place to get a chocolate sundae in San Francisco. The Ferry Building Marketplace is a great stop for sampling different gourmet food options. There are dozens of merchants selling meats, cheeses, and specialty foods, plus restaurants on the waterfront. The Ferry Plaza also has a huge Farmer’s Market that offers prepared foods in addition to fruits and vegetables. It’s one of my all-time favorite farmer’s markets and we had the best rotisserie chicken ever from a food truck at the Ferry Plaza Farmer’s Market. Tony’s Pizza Napoletana gets our vote for best pizza in San Francisco! It is in the Italian North Beach neighborhood of San Francisco and is famous for having multiple pizza ovens set to different temps which can make all kinds of different pizzas. We’ve tried all sorts of delicious pizza’s styled from NY, Detroit, St. Louis and Italy. Know that Tony’s can get very busy. We try to avoid the rush by stopping in for a late lunch, or early dinner. They’ll take your cell # so you can explore the neighborhood while you wait for a seat. Boudin Bakery is our favorite place to get clam chowder in a freshly made sourdough bread bowl. The Bakery is famous for their sourdough bread, which is made fresh all day long. There are several locations, but we always stop at Boudin at the Wharf location when we are visiting Fisherman’s Wharf. There’s a world of fish choices at Fisherman’s Warf if you are looking for fresh seafood! We love to stroll the grab and go areas of the warf but often find ourselves at one of the restaurants perched above the marina too. 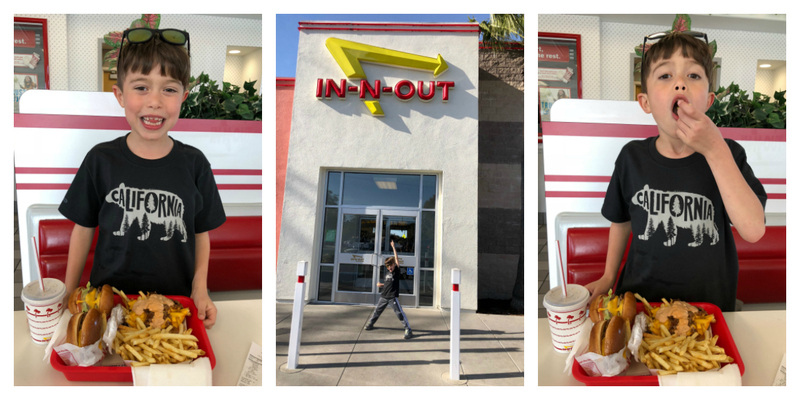 Since we don’t have In-N-Out in Chicago, it is always a highlight of any California vacation. There are several San Francisco locations, including one right by the airport. Often grabbing an “animal style” burger is the first thing we do in San Francisco. There’s also a location by Fisherman’s Wharf, where we spend a lot of time. San Francisco’s Chinatown is a great place to find traditional dim sum, and we always try to stop at least once on our trip. Rather than recommend a specific dim sum restaurant, we just find the one with the longest line as that’s always a good sign. We’ve tried a bunch of dim sum in San Francisco and it’s always good when we follow the crowds. San Francisco is well known for iconic modes of transportation. With street cards and trolleys, you are transported back in time to the golden days of San Francisco. Conveniently, the streetcars and trolleys connect to most of the major sights in the city, so it’s easy to blend them into your San Francisco itinerary. Kids love taking the trolley, so make sure you plan at least one ride on these icons. There are so many things to do in San Francisco with kids. You can easily fill a whole week and still not see everything. Fortunately, we’ve had multiple visits to find our favorite spots, and always leave time to find new favorites! A newer area of Fisherman’s Wharf. This is the spot kids will love. There’s a carousel, fudge shops, a huge trampoline, a lefty shop for left-handed kids, and this is also where the sea lions sunbathe. Kids will get a kick out of watching the sea lions behind Pier 39. Pick up a kite at the San Francisco Kite Company, which sells all kinds of kites, from basic to super fancy. They’ll even set up the kite for you so that all you have to do is walk outside and find a breeze! This museum of science, art and human perception is our favorite kid’s museum in San Francisco. Kids will love the experiential learning opportunities where they can play with everything from prisms and sound, air and other science principals. A trip to the Exploratorium is a great way to spend a couple of hours of your San Francisco vacation. This is the most famous road in San Francisco, which winds back and forth as it descends past residential homes. It’s a great spot for photographs, and there’s a trolley stop right at the top, so you can walk down all the twists and turns of Lombard Street. No sight is more synonymous with San Francisco than the Golden Gate Bridge. Harry loves the views when we drive across the Golden Gate Bridge, and we always get out to take pictures on both ends of the bridge. If you have a car, it’s also fun to drive across the Bay Bridge that connects San Francisco to Oakland. You can also get great photographs of the Bay Bridge from the Ferry Building or the Embarcadero. Our vote for best park in San Francisco! Golden Gate Park is huge, so it’s best explored if you have a car. We like to drive around and park in different areas, and we especially love the giant windmills. Our favorite place for Instagram shots in San Francisco. This Beaux-Arts structure has been featured in many movies and makes a great backdrop for photography. The whole area is lined with big old trees for kids to climb and the nearby park is a great place to let the kids run around and burn off energy. Our favorite place to fly a kite and get the best views of the Golden Gate Bridge. Crissy Field is in walking distance of the Palace of Fine Arts and has wide open spaces with lots of wind, perfect for flying kites. Make sure you stop at the San Francisco Kite Company at Pier 39 before you visit Crissy Field! As you can see, there are many things to do in San Francisco with kids. But there are also great opportunities for a date night at some of the fun bars and restaurants in town. One of our best finds was realizing that Sitters in a Second Inc. also has a San Francisco location. We’ve used Sitters in a Second often in Florida and Southern California. We always receive excellent childcare that allows us to have a date night on vacation. In San Francisco, our sitter came to the Palace Hotel. She was certified in swimming, so she and Harry enjoyed a fun swim night while my husband and I had a date night in San Francisco. With all of the fun things to do in San Francisco, you might never leave. But if you have enough time, there are some fun day trips from San Francisco that we recommend. Drive south down the coast to visit Santa Cruz. 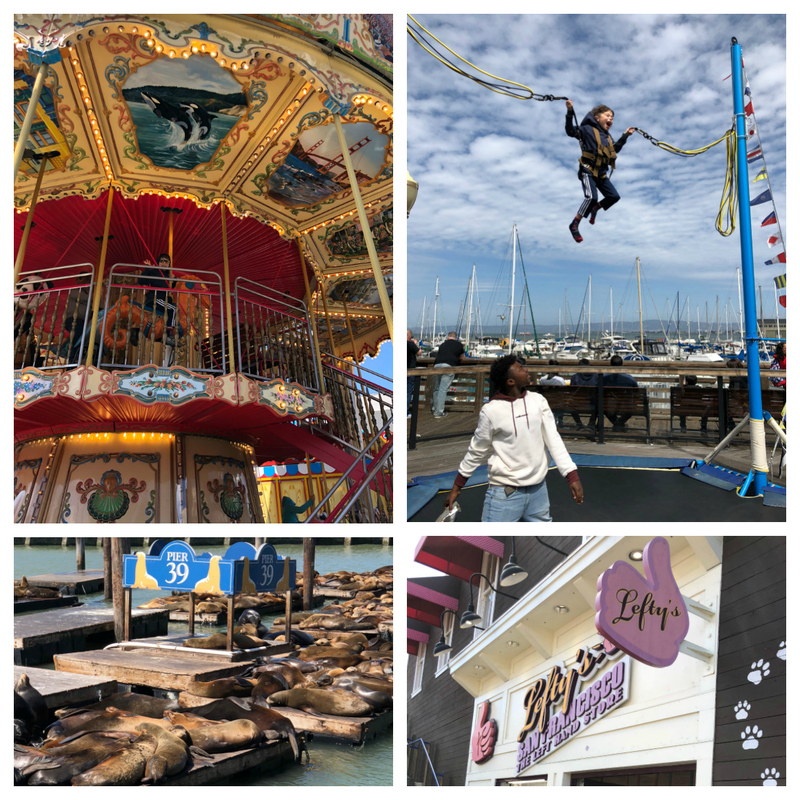 Start at Henry Cowell Redwoods State Park, and then check out the Santa Cruz Boardwalk where you can enjoy the carnival rides, or just chill at the beach. Napa Valley with Kids is more fun than you might think too!